This article is about the sportswriter. For other uses, see Fred Russell (disambiguation). Fred Russell and Grantland Rice, in Nashville, Tennessee, in 1951. Fred Russell (August 27, 1906 – January 26, 2003) was an American sports writer prominent in the Golden Era of Sports in the 20th century. He was a lifelong resident of Nashville, Tennessee and was sports editor and later Vice-President of the Nashville Banner daily newspaper. His career spanned 70 years. He published three books of sports humor in the 1940s. Russell was a protégé and friend of famed sportswriter Grantland Rice. Russell is a member of the National Sportscasters and Sportswriters Association Hall of Fame and the Tennessee Sports Hall of Fame. One of his most enduring legacies was his influence on collegiate sports, specifically as Chairman of the Honors Court of the College Football Hall of Fame for 29 years. The Honors Court determines the inductees to the Hall of Fame. Born in Wartrace, Tennessee, Russell attended Vanderbilt University Class of 1927 in Nashville. At Vanderbilt, Russell was a good student, a member of the Kappa Chapter of Kappa Sigma Fraternity, and a varsity baseball player. He played second base and pitched. He later attended Vanderbilt Law School. 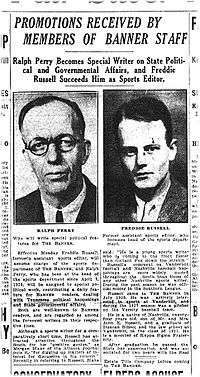 In 1929, Russell was hired for the police beat by the Nashville Banner. The following year, Russell became the Sports Editor of the Banner, replacing Ralph McGill. Russell would be a member of the Banner staff until the paper closed in 1998. Over the next 68 years, Russell wrote over 12,000 columns, mostly in a column named Sidelines. Nashville Banner announcement of Russell's promotion to sports editor, 21 September 1930. Russell covered the major sports in America for over 65 years. His heyday was the Golden Age of sports—the 1930s to the 1950s—when newspapers were the principal form of media and news, before television and money became the central emphasis of modern sports. While Russell was always focused on covering Tennessee and southern athletics first, he nonetheless was well-known nationally and had a unique insight into the growth and expansion of athletics in the nation. The sports and events he annually and regularly covered and contributed to were: college football; amateur and pro baseball; the Masters Golf Tournament; the Kentucky Derby; championship boxing; college football bowl games, including The Sugar Bowl and The Rose Bowl; and The Olympic Games (1960–1976). Russell gained national notoriety in the 1940s and 1950s for writing one of the most popular annual college football previews, the Pigskin Preview, for The Saturday Evening Post, one of the most popular magazines of that day. He covered the major Bowl Games throughout the decades. Russell was one of the principle journalists involved in the growth and popularity of college football, the Southeastern Conference, and the National Collegiate Athletic Association (NCAA). Among Russell's trademarks was his emphasis on the lighter, humorous side of sports as well as his penchant for playing practical jokes. His three sports humor books, I'll Go Quietly (1944), I'll Try Anything Twice (1945) and Funny Thing About Sports (1948) were collections of humorous quotes, jokes, anecdotes and stories from the world of sports. The first two were published specifically for American troops in World War II, before television and radio were able to entertain troops abroad. Russell was instrumental in the formation and history of the Tennessee Sports Hall of Fame, honoring those who have excelled in contribution to sports in Tennessee. In 2003, the Hall began the Fred Russell Distinguished American Award, given annually to a Tennessean who has exhibited excellence in their contribution to sports. Russell's memorabilia, including his personal items, photographs, awards, honors, are in several locations in Nashville. These locations include The Nashville Downtown Public Library Nashville Banner History Room and Exhibit; the Tennessee Sports Hall of Fame; and The Brentwood Academy exhibit room in Brentwood, Tennessee. In 1998, the Banner folded and it was assumed that the 92-year-old Russell would retire. Instead he was hired to write a weekly column for The Tennessean. He completed his 70th year as a journalist in 1999, then retired. Russell penned his last sports column for the multi-author book Nashville: An American Self-Portrait in 2001. His byline thus appeared in nine different decades. An influential figure in the Golden Age of sports, Russell was sports editor of the Nashville Banner for 68 years, from 1930–1998. In an era when newspapers were the primary form of information to the public, well before television was popular, Freddie Russell was a local legend in Middle Tennessee and was well known in the sports world throughout the nation. Russell was widely regarded throughout the South as one of the foremost authorities on the world of sports. He was the primary Nashville and Middle Tennessee sports man for most of the 50-plus years he was the Sports Editor at the Banner, having close friendships with the notable Nashville sports leaders of the era, such as Ed Temple, Larry Schmittou, future SEC Commissioner Roy Kramer and many others. He has influenced many young people through the TRA Rice-Russell Scholarship. Many well-known writers today were Rice-Russell scholars, including Roy Blount, Skip Bayless and others. Many other sportswriters such as Doug Segrest (Birmingham News) and Lee Jenkins count Russell as a mentor and friend. Segrest began his career at the Banner. As the Chairman of the Honors Court of the College Football Hall of Fame for 29 years, Russell was the primary decision-maker regarding those who were inducted into the Hall of Fame. Many of those inducted credit Russell with their award and were grateful for his support and friendship. Russell was a mentor of ESPN's Buster Olney, who attended Vanderbilt and began his career as a reporter for the Banner before his ascension to the top of the sports reporting world. He impacted countless Vanderbilt student-athletes through the years. Whether he was writing about them, promoting their careers and endeavors, befriending them as they entered the professional world, and/or welcoming them back to Vanderbilt through the years, Russell was the mainstay of the Vanderbilt community. One example is Art Demmas, legendary NFL umpire for 29 years. Demmas today is the Southern Region Chairman of the National Football Foundation. Demmas and Russell worked together for 42 years as the primary founders and leaders of the Middle Tennessee Chapter of the NFF, which today is one of the biggest Chapters of the NFF. Demmas was a star football player for Vanderbilt in the 1950s. Early in his career, Demmas was a high school referee and got to know Russell. Later, Russell helped Demmas get a position as a college football referee. After working for several years at the college level, Demmas was recruited into the NFL as an umpire and later became an official. Another example is Nashville radio personality George Plaster. Plaster counts Russell a great influence and a major reason for his success. Russell helped Plaster get his initial broadcasting position at Vanderbilt. Plaster went on to be the Broadcaster for Vanderbilt athletics. He moved into the sports talk show industry in Nashville, and today he is host of the top-rated and most popular sports talk show in Tennessee, The Zone on 104.5 FM. Russell was one of the primary journalists who covered the Tennessee State University Tigerbelles track team in their amazing success in the 1960 Olympics in Rome. Russell and TSU coach Ed Temple remained friends throughout their lives. Wilma Rudolph, who is originally from the town of Clarksville near Nashville, was one of the heroes of the 1960 Olympics. 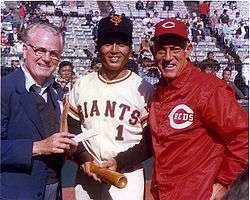 Russell, Japanese slugger Sadaharu Oh and Sparky Anderson in Tokyo, Japan in 1981. Grantland Rice has long been considered the dean of American sportswriters. Rice and Russell were longtime colleagues and shared many similarities. They were both Tennesseans and graduates of Vanderbilt University, and the two had similar styles as writers and people. Rice was originally from Murfreesboro, Tennessee, and he worked as a sportswriter in Nashville before joining the New York Herald (later Herald Tribune) from 1911–1930. Many in the world of sports and sports journalism consider Russell to be another one of the deans and pioneers of American sportswriters. Always possessing the qualities of a gentleman, Russell was focused on the craft of writing and reporting and his legacy of promoting the people, groups and teams that he covered. In football, Russell was a contemporary and friend of Gen. Bob Neyland, Coach Paul 'Bear' Bryant, Red Sanders and many others. Russell actually helped Bryant get one of his first assistant coaching jobs at Vanderbilt. The two remained lifelong friends. 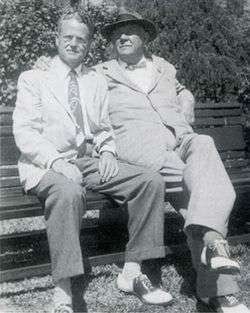 Red Sanders was the Head Football Coach at Vanderbilt before going to UCLA, and both were also lifelong friends. As a longtime baseball writer, especially in the 1940s, 1950s and 1960s, Russell often spent as long as a month covering spring training each year. He and fellow sportswriters such as Red Smith and Bill Corum would often travel together and stay with players in Florida (at hotels like the Soreno Hotel in St. Petersburg). Russell became a friend of many of the notable baseball stars of that era, as he covered legendary teams like the Yankees, the New York Giants and the Brooklyn Dodgers. Even into the later years of his career, he was highly regarded by the legends of baseball, from Tommy Lasorda to Bowie Kuhn to Joe DiMaggio. Russel covered the inaugural and then over 40 Masters golf tournaments in Augusta, Georgia, all the while remaining a friend of Bobby Jones and the other golf pioneers of the day. He covered major championship boxing and was a friend and contemporary of Heavyweight Champion Jack Dempsey. At the 25th Anniversary of Russell's career at the Nashville Banner, many paid tribute to Russell. The 1955 celebration included stars such as football greats Red Grange and Bear Bryant, Bobby Jones and Jack Dempsey, as well as writer Red Smith from New York, all attending to honor their friend Freddie Russell. In 1954, the Grantland Rice Scholarship at Vanderbilt was begun in honor of Rice. Endowed by the Thoroughbred Racing Association (TRA), the scholarship is awarded annually to an incoming first-year student with an interest in sportswriting. Russell was from the beginning involved in the administration and selection process of the scholarship. Later, in 1984, the TRA and its president, Charles J. Cella, endowed the scholarship in honor of Russell, making it the Fred Russell-Grantland Rice Sportswriting Scholarship. The scholarship is an annual award of $10,000 toward tuition at Vanderbilt. Russell was elected to the National Sportscasters and Sportswriters Association Hall of Fame in 1988 and into the Tennessee Sports Hall of Fame in 1974. At the time, he was only living sportswriter to receive the honor. He became a Charter Member of the Tennessee Sportswriters Hall of Fame in 2005. Russell received the Distinguished American Award in 1980 given by the National Football Foundation (NFF). The award is given for excellence in exhibiting superior qualities of scholarship, citizenship and leadership. Two of the previous winners of the award were Vince Lombardi and Bob Hope. He was the Honor's Court Chairman of the College Football Foundation and Hall of Fame for 29 years. Russell is a past President of the Football Writers of America. He was also a member of the Heisman Trophy Committee for 46 years and was the Southern chairman of the Heisman Trophy Committee for 30 years. Many members of the College Football Hall of Fame credit Russell with their election to the Hall. Russell received the Amos Alonzo Stagg Award in 1981 from the American Football Coaches Association, that same year he was awarded the Bert McGrane Award from the Football Writers of America. In 1983, The National Turf Writers Association (horse-racing) awarded Russell the Walter Haight Award for Excellence in Turf Writing, he received the Red Smith Award for his contributions to journalism in 1984. In 1957, Russell received the inaugural Grantland Rice Memorial Award. The award was presented by the Sportsmanship Brotherhood of New York to the "sportswriter in the United States who in his writing most nearly approaches the Rice tradition." Russell was named to the Vanderbilt Athletics Hall of Fame as part of its inaugural class. Russell was awarded the Distinguished Journalism Award by the U.S. Olympic Committee in 1976. Russell was awarded the Kappa Sigma Man of the Year in 1981. In his hometown of Nashville, Russell was a longtime member of the Nashville Metropolitan Board of Parks and Recreation. He was instrumental in the development of Nashville's many recreation and athletic facilities. Russell and his wife Katherine Early Russell were married for 63 years, until her death in 1996. They have four children, all daughters, and eleven grandchildren. Russell worked past the age of 90 and lived until the age of 96. Russell also of course influenced his family members. He was contracted by the United States Government during World War II to write entertainment books for the American troops. He was on the forefront of progressive, visionary journalism promoting African-American minorities in the 1950s, 1960s and 1970s, especially during the Civil Rights era. He covered these important people and figures when many other journalists would not. The press box at Vanderbilt Stadium is named in honor of Russell. ↑ Traughber, Bill. "Fred Russell was a Vanderbilt man" (PDF). Retrieved February 8, 2015. ↑ John A. Simpson. The Greatest Game Ever Played In Dixie. p. 227. ↑ The NFF is the organization that directs and funds the College Football Hall of Fame. ↑ The Election Board for the College Football Hall of Fame usually consists of 8-10 people on the board. ↑ Other winners of this award were Paul 'Bear' Bryant (1983) and Woody Hayes (1986). ↑ "Vanderbilt Athletics Announces Inaugural Hall of Fame Class". Vanderbilt University. 2008-06-26. Retrieved 2008-06-26.